Writer. Editor. Book coach. Creative to the bone. I help coaches, therapists, healers, soul folk and visionaries share their magic through the written word. I honor your privacy and will never spam or share your information. Thank you for signing up! Look for an email in your inbox! Birthing your book is more than just a project to get done. It is a soul-stirring call to put your expertise and wisdom into a potent resource that will help you grow and provide tremendous transformational benefit to your clients and community. I can help you turn your book dream into a reality. In 2019, I’m offering private coaching as always and a new group program. Revolutionize your relationship to time. Honor your whole being in an intentional, supportive way. 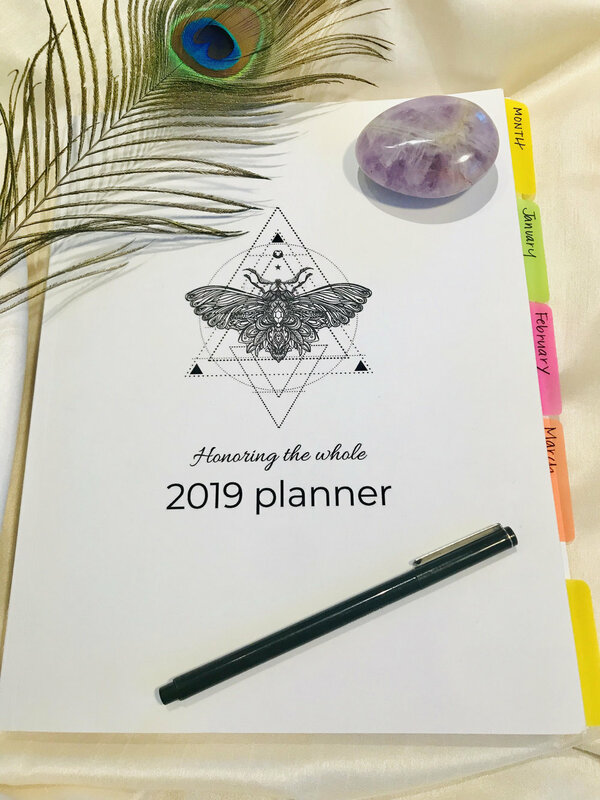 This planner draws on the wisdom of nature’s cycles and encourages regular holistic reflection to help you experience time in a rich and intentional way. Includes month-at-a-glance and six months of undated daily pages sure to bring more consciousness, clarity and ease into your days…and your life! Click for more images and details about the planner. Birth Your Story: Why Writing About Your Birth Matters empowers and supports mothers and fathers in writing about birth, to remember, process, claim, heal and honor it all. "The healing potential of story in birth is profound and only beginning to be tapped into by mothers - mothers who have struggled, lost, succeeded, triumphed and want to make the most of their experience as a journey of growth and being deeply human, deeply woman. If your journey of birth and motherhood is in need of witness, healing, hearing, or sharing - and you don’t know where to start - or if putting pen to paper makes you freeze up but there’s a story that is calling out to be told - Birth Your Story is where I suggest you go to birth your inner writer." "Birth Your Story reads like a midwife or doula feels: wise, grounded, clear, no bullsh*t, unflappable and totally loving, with a sacred reverence for the whole wild and winding journey of birth. What a joy to discover Jaime Fleres’ book, that not only guides us through the transformational writing process, but into a deep reclamation of our body, power, fragility, wisdom and divinity. Whether a seasoned writer or a blushing novice, no matter: open this book and write on." "Jaime Fleres’s Birth Your Story is the perfect gift for expecting couples and new (and not so new) parents. Jaime’s warmth and wisdom encourage and empower readers to write and embrace their birth stories. But this book is so much more than a how-to book; it’s a celebration of love and the power of what our bodies and minds are capable of. It’s a must-have book for any parent in your life." "With great compassion, Jaime clearly communicates not only why telling our stories is so vitally important, but how to tell them in a way that will heal, empower, awaken and enlighten. My greatest wish is that this book inspires you to share your creation story—the beautiful, the heartbreaking, the awe-inspiring and the revolutionary. Your voice matters, your experience counts, and your story takes us all higher." "Jaime Fleres’s book, Birth Your Story—part memoir, part guide—makes a unique contribution to how we look at birth and why writing our story matters. I wish I had this book 25 years ago as I was birthing my children. It would have encouraged me to look at other options for how I wanted to bring a baby into the world. This is an important book that will help you discover the gift of creation both in the womb and on the page." "Whether a woman has had the birth of her dreams, or the opposite, there is raw ecstasy in fully owning the experience. Jaime Fleres artfully supports women to find their power through writing their stories, sharing not just the details of the birth, but exploring their inner landscape in the process. Birth Your Story is a heartfelt reminder that in the journey of birthing our babies, women are reborn as mothers. Use this book to consciously explore and unearth the gifts you've received along the way, alchemizing every drop into showing up more vibrantly as woman and mother." "Jaime Fleres guides parents to the pen of self-exploration with kindness, wit, and compassion. Why write our birth stories? Jaime reminds us that in telling our stories, we share our hearts, honor sacred passages, and bring healing insight to both ourselves and our world."